Snitker is very dedicated to the Braves organization. "To say that I love the Braves is an understatement, because this organization has afforded me and my family a way of life that I could have never imagined," Brian said. Brian lives in the Atlanta suburb of Lilburn with his wife, Veronica, and son, Troy, and daughter, Erin. Brian did not necessarily expect to sell his house as quickly as he did in the winter of 2015-2016, and he certainly did not anticipate the opportunity he gained when the Braves dismissed former manager Fredi Gonzalez. So for now, Snitker will simply appreciate that he is likely the only big league manager living in his daughter's basement. "It works out well because my wife babysits the grandkids, so it's to [my daughter Erin's] benefit to have us there because she's a nurse at Piedmont Hospital," Snitker said. "When she works, Grandma can take care of the kids. That's why we want to move a little closer, so that we still can do that." Snitker went to Spring Training 2016 with the assumption he would look for a new house while tending to his duties as Triple-A Gwinnett's manager this year. But now, he'll be looking for a new Gwinnett County residence while serving as Atlanta's interim manager, the role he was given after Gonzalez's dismissal. Throughout Spring Training, Snitker proudly spoke about his grandsons (9-month-old twins), and he mentioned how nice it was to see them again via FaceTime when he spoke to his wife after winning his first game as a big league manager last week. "Being a grandparent is 10 times better than anyone told me it would be," Snitker said. "It doesn't even come close." When the Braves returned from a road trip in May, Snitker walked toward his new office and proudly saw his nameplate positioned beside the door. But when asked if he took a picture, he provided further indication of how proud he is to be a grandfather. Snitker was born and raised in Macon, Illinois—a town in the middle of the state with a population of roughly 1,200. He is one of five notable people from Macon listed in its Wikipedia page, along with Dale Connelly (a co-host of Minnesota Public Radio’s Morning Show), Nelson Kraschel (Governor of Iowa in 1937-39), Toby Towson (an NCAA gymnastics champion), and Art Wilson (big league catcher from 1908-21). Snitker was a starting outfielder on a Macon team that lost the state championship game in the 1971 Illinois all-school baseball playoffs, where it fell to a team from Evanston. It is the smallest school to ever play in the championship game, advancing from a field of 370 high schools in Illinois. That Macon team wore hand-me-down uniforms and Caterpillar tractor ball caps that wound up being covered with peace signs after other schools complained of the commercial nature of the caps. It was reluctantly coached by Lynn Sweet, a self-described hippie, who didn’t mind his players having long hair and playing “Jesus Christ Superstar” in the dugout before games. There was even a book, “One Shot at Forever: A Small Town, an Unlikely Coach, and a Magical Baseball Season,” written about that team. Aug 5, 2016: Snitker grew up in Macon, Illinois. It's a two-hour drive from Busch Stadium, where the Braves will face the Cardinals, a place that fits the population of Macon inside of it over 22 times. Though he grew up rooting for the Cubs due to his dad's fandom, Snitker holds fond memories of St. Louis as well. "This is where we would come," Snitker said. "My dad and uncles, we'd bring everybody. We'd park the car in one of the garages and we'd walk across the catwalk to old Busch Stadium. Mom would make chicken and we'd tailgate and then come to the game. It was great." His time in St. Louis has clearly left a mark, but it's his fabled 1971 Macon High School Ironmen who will go down in history. Snitker was a sophomore right fielder when his small-town school made it to the state finals against Waukegan before schools were divided by size. Even though his team lost, it inspired a book as a sort of baseball equivalent to "Hoosiers." His high school coach, Lynn Sweet, and a number of players from that 1971 team were in attendance, according to Snitker. "The small-town relationships and the country hard ball we played," Snitker said. "We were a pretty good little team." March 4, 2019: As Braves manager Brian Snitker looked across the field and saw Troy Snitker prepping for his first season as the Astros hitting coach, he couldn't help but think about the countless experiences he had shared with his son here at ESPN's Wide World of Sports complex and in countless Minor League cities. "I raised him on a baseball field, in the clubhouse and on a bus," the reigning National League Manager of the Year said. "I remember when Glenn Hubbard gave him a little training glove that they used when he was a kid and hit him ground balls. So I'm probably to blame because he doesn't know any better but to do the baseball thing." Looking back, Troy Snitker wouldn't have wanted his childhood to have unfolded any other way. Those many hours spent serving as a bat boy, experiencing long bus rides and observing his father helped direct him to his current role as a 30-year-old big league hitting coach -- who had just three years of professional coaching experience before the Astros promoted him this winter. "I was always around and I was always watching," Troy said. "There were just so many experiences and lessons. I saw how [my dad] handled himself and dealt with the players and coaches and how he treated players and how he went about his business." Astros manager AJ Hinch brought Snitker over from Minor League camp to serve as a coach and exchange lineup cards with his dad before two games last year. Repeating this ritual before Monday's 4-3 Astros win proved extra special for the Snitkers, who for the first time find themselves simultaneously preparing for a Major League season. In 1977, Snikter signed with the Braves as a non-drafted free agent, out of the University of New Orleans in Louisiana. "Bob Didier signed me to fill out a roster," Brian said. "I played real hard to be mediocre." Brian was a backup catcher for four seasons in the Atlanta farm system. How long has Snitker been in the Braves organization? As of January 2017, there have been 699 players who have worn an Atlanta Braves uniform since Snitker joined the organization in 1977—the year before Dale Murphy made his first Braves Opening Day roster. It was the year before the Braves made Bob Horner a first-round draft choice, and 13 years before Chipper Jones was the first player selected in the draft. It was seven years before the Braves used a second-round pick on Tom Glavine, and a decade before the Braves sent Doyle Alexander to the Tigers for righthanded prospect John Smoltz. And it was the year that then-owner Ted Turner—upset at an 8-21 start—told manager Dave Bristol to take a 10-day vacation in May, and Turner named himself interim manager. This lasted for one game, after which then-commissioner Bowie Kuhn told Turner that anyone who owned stock in a team was forbidden from managing it. 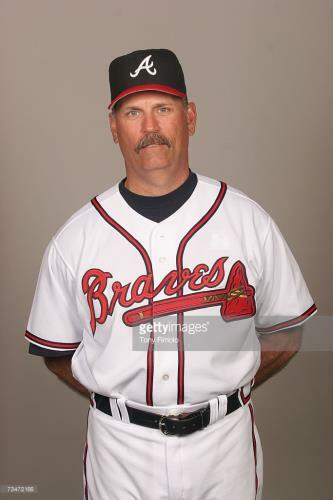 Snitker was a critical figure in helping to develop the homegrown players who were so critical in the Braves winning a professional sports-record 14 consecutive division titles from 1991-2005. "Hank Aaron offered me a job as a coach after the 1980 season. I was single and living out of my car, so I decided to see what would happen," Snitker recalled. Snitker's coaching and managing assignments have included stops in Macon, Sumter, Anderson, Greenville and Durham. Brian has had two stints in Atlanta as the Braves' bullpen Coach in 1985, and then again from 1988-1990. 1999-2001: Manager for the Myrtle Beach Pelicans (CAR-Braves). 2002-2004: Manager for the Greenville Braves (SL). 2005: Manager for the Pearl, Mississippi Braves (SL). 2006: Snitker moved up to Richmond (IL) as Manager. 2007: Snitker joined the Braves in Atlanta, as third base Coach. May 17, 2016: Brian was named interim Manager for the Braves when Fredi Gonzalez was fired. October 11, 2016: The Braves name Snitker manager. Snitker has served as one of the most respected and influential coaches within the Braves' farm system over the course of the past four decades. Though he had logged many years as a Minor League manager, there was never a thought of him handling the role at the big league level until he was unexpectedly given the opportunity this year. A little more than five months after accepting the unenviable task of interim manager for an Atlanta team that had struggled under Fredi Gonzalez, Snitker now stands as one of 30 men on Earth who will enter next season as a Major League manager. The Braves, impressed by the way their players responded to the direction they were given during this season's final four months, opted to remove the interim tag from Snitker's title, when they announced he would return as their manager next year with a one-year contract and an option for the 2018 season. "This is a good day for the Atlanta Braves," Braves general manager John Coppolella said. "Snitker earned this opportunity. There was nothing he did that told us he was not the right guy for the job." He changed the clubhouse culture and created a positive vibe throughout our organization. There were multiple players who came to me this year and said, 'Snitker is the best manager I've ever had.'" Oct 5, 2017: Snitker's managerial stint was extended, when the Braves announced his contractual option for 2018 had been exercised. This news served as an early birthday president for the Cobb County resident, who will turn 62 on Oct. 17. He will now prepare for what will be his 42nd consecutive season within Atlanta's organization. October 15, 2018 : The Braves Re-Signed Snitker to Two-Year Contract. Nov. 13, 2018: A year after doubting whether he'd have the chance to extend what was an unexpected opportunity, Braves skipper Brian Snitker can now proudly lay claim to the 2018 National League Manager of the Year Award. Snitker was overwhelmed with joy and gratitude when he was announced as the winner. Less than three years after being given what was expected to be a short-term, interim role as a Major League manager, he proved that he was the right man to lead the Braves through a rebuild and back to the postseason.